A Canadian soldier has been killed and several others wounded by so-called "friendly fire" in Afghanistan. Two US planes were reportedly involved in the incident in which Nato soldiers were fired on as troops battled Taleban insurgents in the Panjwayi district. It comes after four Canadian soldiers were killed over the weekend, and 14 UK troops were lost in a plane crash. In a separate incident, at least four Afghan civilians and a UK soldier were killed in a suicide attack in Kabul. The friendly fire death happened at dawn, west of Kandahar city, when ground troops requested air support. Two Nato aircraft responded, but fired cannon at their own soldiers during a strafing run. Several soldiers were wounded. Nato said two US A-10 Thunderbolt planes had accidentally fired on the troops, the Associated Press news agency reported. Lt Gen David Richards, head of Nato forces in Afghanistan, sent his sympathies to "all of the soldiers and their loved ones who've been affected by this very sad incident". "It is particularly distressing to us all when, despite the care and precautions that are always applied, a tragedy like this happens," he said. An investigation has been ordered into the incident. About 2,000 Nato and Afghan soldiers are involved in a massive operation against the Taleban in southern Afghanistan. Operation Medusa is the biggest military operation there since the Nato-led International Security Assistance Force (Isaf) took over the area from a US-led coalition at the end of July. It is concentrated on the Panjwayi area, about 35km (20 miles) west of Kandahar city, which has seen months of fighting. 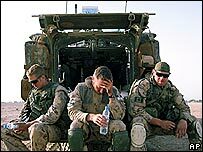 Nato says 200 Taleban fighters were killed in pitched battles on Saturday and Sunday, in which four Canadian soldiers also died, but the Taleban said its number of casualties was far lower. 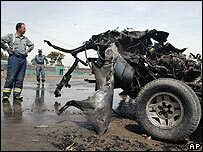 Monday's suicide car bomb attack on a Nato convoy happened on the Kabul-Jalalabad road. At least three UK soldiers and four civilians were injured in the blast. Initial reports from Afghan police said two British soldiers had been killed, but in a later statement the UK Ministry of Defence (MoD) said one soldier had died and another was very seriously injured. Nato spokesman Mark Laity told the BBC that Nato forces were currently undergoing a period of "intense combat", particularly in the south of the country. But he said forces were "not fighting for fighting's sake". "Our ultimate goal is still the same as when we came - which is to secure more stability in order that development and governance can take place." On Monday, police in southern Afghanistan said they had beaten off an attack by Taleban rebels on local government headquarters in the town of Garmser in Helmand province. The town's police chief said 16 Taleban fighters had died in the attack. Three policeman were also killed during several hours of fighting. In a separate incident, two policemen including a senior officer were killed in an ambush near Kabul, the Afghan officials said. The attack took place late on Sunday in Parwan province about 30km (18 miles) north of the capital.